Vumelana is a non-profit organisation that helps communities in the Land Reform Programme to develop their land. It funds advisory services to structure commercially viable partnerships between communities and investors that create jobs, income and skills. Vumelana aims to demonstrate the value of markets and partnerships as a means of increasing access to land that can be used productively, improving land tenure, and providing linkages to finance, skills and networks needed to make effective use of land. This encourages a more inclusive agenda for land reform. Applications for funding are invited from communities, government departments, advisors or investors. A co-operation agreement is signed with the community setting out the basis of the relationship between the community and Vumelana. A transaction advisory team is contracted to structure an agreement in terms of which the community makes the land available and the investor undertakes to finance and manage operations. The transaction advisory team procures proposals from potential investors which show how the land will be developed to create jobs, income, skills and other benefits for community members. 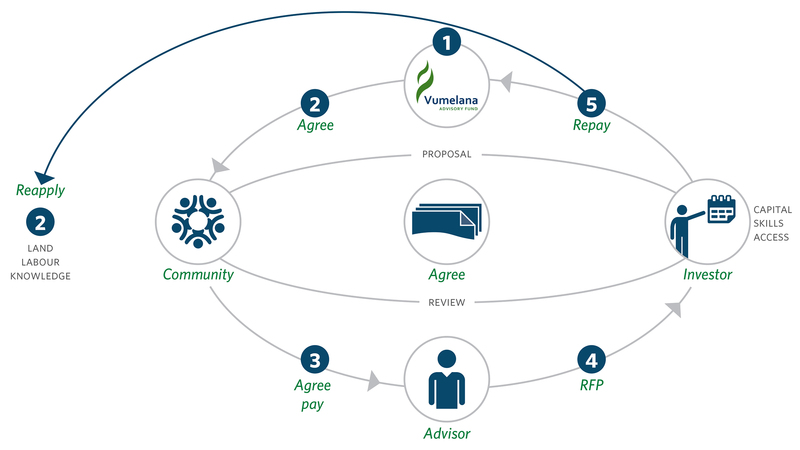 Once an agreement is signed, the investor reimburses Vumelana for the costs incurred by the transaction advisory team in putting the deal together. The reimbursed funds are used by Vumelana to finance support for the Communal Property Institution for a period of up to two years. How do we decide what to support? Agreements should produce mutually beneficial results for communities and investors. Properly elected and effectively supported community bodies should make the key decisions on whether or not to accept an investment proposal. Projects supported should be commercially viable and have a positive social impact in terms of jobs, income and skills for the community. The ultimate assessment of commercial sustainability will be made by the investors who risk their resources in the development. Commercial ventures require those involved to risk resources in pursuit of a reward. It is important that the risks are carried by parties that are able to accept them. The most successful community private partnerships are those where the private investor carries the commercial risk at inception and the community has the right to acquire an increasing stake in operations as they move to profitability. The transaction advisory team should be independent of the community, the investor and Vumelana and should not have a financial interest in the projects supported. The outcome of the deal structuring process should be an agreement that is fair to all parties and is legally secure. In order to be eligible for support, the Communal Property Institution should be registered, its members should be poor and needy people, and it should have sufficient rights to the land to be able to develop it. The land to be developed should fall within South Africa’s Land Reform Programme. Vumelana aims to support those projects that have the greatest potential impact on the communities involved. Proposals are assessed on a competitive basis. Those which Vumelana judges to be the most likely to succeed are supported. 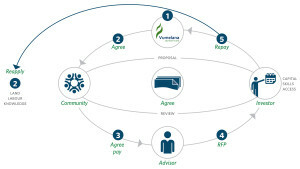 In making that assessment Vumelana considers the likely socio-economic impact of the project, the commercial viability of the proposed development, the stability of the Communal Property Institution, the need for government support, the potential for concluding a deal, the quality of the proposal, and the experience of the transaction advisory team.